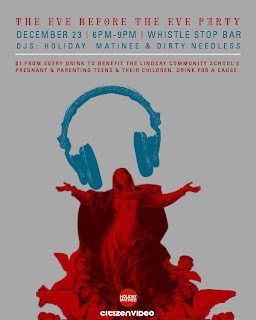 Citizen Video is joining forces with some awesome local peeps this holiday to help support the Lindsay Community School's pregnant and parenting teens and their children. Stop by Citizen Video and drop off a gift for the gift drive and get $5 off any of our newly printed tshirts. Moms need new or lightly used clothing or toiletries. Moms are age 12 to 18. Children need baby essentials - diapers, clothes, blankets, bottles, etc. Children are ages 4 weeks to 3 years. We'll finish up our gift drive with our EVE BEFORE THE EVE PARTY at the Whistle Stop on December 23rd. One dollar from every drink will go to benefit the Lindsay Community School. Need an excuse to have a drink during the madness of the holidays. Well now you have a great one.